Thank you for your continued support of Malcom's products. Starting from December 2018, we would be grateful to sell our new product PC-11 series Spiral Viscometer. With the launch of it, we have terminated the sale of PC-10 series Spiral Viscometer. Feel free to contact us if you have any questions and inquiries. We would like to inform you that the sale of the STA-2 ends when all the stock is sold out. However, we will continue to sell the parts of this product. If you have any questions or need clarification, please feel free to ask us. We would like to inform you that the price of SP-2 Inspection certificate has risen, as we have reviewed its whole calibration process. Please contact us if you have any questions or need clarifcation. We hope you are doing well and we deeply appreciate your kind support. Now we would like to inform you that we will discontinue the production o fthe tools undermentioned, and appreciate your consideration of the current alternative models with the better product features instead. We deeply apologize for your inconvenience, and hope to have your understandings on the product transition. Termination Period: The date when all the stock has been sold out. P.S. For after service with the tools above mentioned, we will continue supplying the spare parts until 30th of September 2023. Should you have any questions, please feel free to let us know. PLDT finally finished repairs last July 26, 2018. 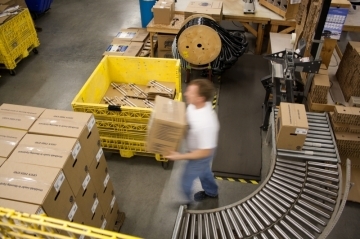 You can now reach us again through our trunkline 02 8268802. We are experiencing a prolonged repair time from PLDT for our main trunk line, 02 826 8802. Thank you and our apologies for the inconvenience. Thank you for your continued support of Malcom products. We would like to take this opportunity to inform you that we will terminate the repair work of RC-50 Flow Profiler in October 2018, as our holding period of repair parts are 8 years and we are unable to ensure replacement parts over this period. For the future, we are pleased that you purchase the enhanced model FCX-50. The price on scredriver cords have not been reviewed yet for years even though the cost of its parts had been increaseing due to higher material cost, especially by increasing oil price, the related energies and distribution cost, etc. The new prices will be effective on June 21st, 2018. If you have any questions, plesae do not hesitate to contact the HIOS distributor for your area. This is to inform you that we will ask you to write the following things on your PO when you order RCX series. It is important to specify ADJUSTABLE ARM SPECIFICATIONS. 1. Please write "type A" or "Type B" on your PO. Depending on the upper and lower clearance of a reflow oven entrance, we can offer you two types of ADJUSTABLE ARM as below. 2. Please write each size (S, M, or L) of two pcs. of ADJUSTABLE ARM on your PO, according to the following "MEMORY UNIT WIDTH with ADJUSTABLE ARM LIST". The purpose of this communication is to inform you of an increase in our prices on the following parts. We always strive to keep the prices unchanged, but the price increase is sometimes unavoidable. Due to the cost increase on the steel used in the parts above. At the same time, the following parts will be added to the rails as add-ons. Thank you for your understanding and patronage. As always, thank you for your business and cooperation. The purpose of this communication is to inform you that HIOS will be discontinuing the ClT-50AF series per the outline schedule below. *We may change the deadline for final purchase orders depending on the stock status of its parts. Production has been already terminated and no more stock available. It is getting hard for us to get some important parts at the same costs due to less demand on the ClT-50AF series. *Even before August 2022 we may not be able to supply or repair some parts due to stock shortage of the parts. If you have any concerns or need additional information regarding this discontinuation, please feel free to contact us. We regret to tell you that our stock of CE-220-65 heater has sold out. As per our earlier notice, because of current decreasing of demand of 220V-65W replacement heater element, we are facing difficulty to purchase them. So, unfortunately, we decided to discontinue this model. Today is a non-working holiday as we are celebrating Paranaque City Day. Work resumes the following day, February 14, 2017. After‐sales service: As for repairing and parts supplying for above discontinued models, we will finish the service on 2021/9/30. Please do not hesitate to contact MVENT Philippines, Inc. if you have any question about products. This is to notify you that some models of our V-Cut Solder Machines and Pre-heaters will be discontinued after current stocks are sold out. BON-002 (100V) and PHN-3040 is still on sale. This is to notify you that the soldering iron tips listed below will no longer be produced, due to material unavailability. We can only offer them until supplies last. Please accept our apologies for any inconvenience this may cause. We have made the cost savings, and have been making efforts to keep the parts price. However, fluctuations of foreign currency exchange rates, the increase of expenses and etc. unable for us to maintain the current price. This is to notify you that our products (please refer below) will be discontinued after current stocks are sold out. If you have any questions on this matter, please feel free to contact us. 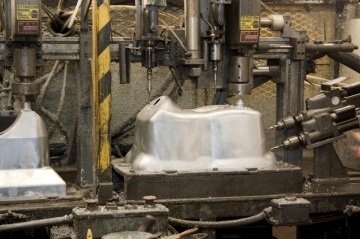 perma-tec has been providing innovative and creative lubrication solutions for almost 50 years. Our single- and multi-point lubrication systems can be found in almost all types of industries and applications around the world. perma-tec's leadership in single-point lubrication is based on many patents and certifications. All perma products are developed, tested and manufactured in the company's German headquarters and live up to the "Made in Germany" quality standard. With many years of experience and a network of subsidiaries and competent partners around the world we can offer our customers lubrication solutions that meet the highest technical requirements. For more information, please see our product page here. This is to notify you that our price for Solder dipping temperature sensor P/N: SC-007 will increase, effective July 01, 2015, due to the increase in the cost of raw materials. We hope that you will understand the situation we are in. We appreciate your understanding and our continued relations. We are currently migrating to a new and improved website. New products and updates will be back soon. This is to notify you that our product SG12-10A soldering iron tip will be discontinued producing due to the material is no longer available. These are limited to stock on hand, and we can offer them while supplies last. This is an announcement concerning revision of Repair and Calibration Fee. We have made the cost savings, and have been making efforts to keep the price of repair and calibration services. However, fluctuations of foreign currency exchange rates, the increase of expenses and etc. unables for us to maintain current price. Therefore, starting from 1 May 2015, we will revise the price as below. The basic technical fee on repair service will be revised. When doing both repair and calibration, repair technical fee and calibration fee will be charged. Cancellation fee will be also revised. If you have any questions or need clarification, please feel free to contact us. BON-102S (extra-fine brush type) will join the Trial Kit from OCT.21, 2014. Please contact us for quotation. This is to notify you that our product CRC-150 Voltage slide type controller has discontinued production due to material supply problem. Our phone and fax lines were repaired today. You can contact us at any of our landline numbers again. Due to an unscheduled maintenance by PLDT, the telephone service in our area is temporarily out of order. Please contact us at our mobile +63 917 9415047, or through email [email protected] instead. Our trunk lines and DSL Service were just restored! You can now contact us again at +63 2 8268802. Due to the theft of PLDT telephone cables in our area last night, November 5, our trunk and fax lines are temporarily out of order. This is to notify you that our product "Kiwami Controllers" (please refer to list below) are scheduled to be discontinued production due to the material is no longer available. This is to notify you that our products (please refer to list below) will be discontinued after current stocks are sold out. Replacement parts are still in stock and can be provided to you. This is to notify you that our products (please refer to below) will be discontinued after current stocks are sold out. TWO PESTS. ONE SOLUTION. INTRODUCING THE JIFFY STEAMER X-SERIES. With the fast, effective power of pure steam, the Jiffy Steamer X-Series steamer easily kills dust mites and bed bugs on contact without the use of a single chemical or fumigation product. Best of all, it's safe for your family and the environment. 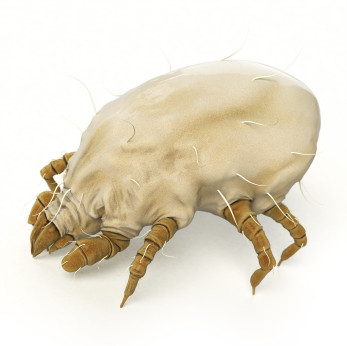 Dust mites, microscopic pests that feed on your dead skin cells, are a leading trigger of asthma and allergy symptoms across the globe, making their presence a particular concern for parents and families. Of the 24.7 million documented asthma sufferers in America, over 20 million have a dust mite allergy. Bed bugs are not just found in hotels, they have been documented in places like movie theaters, office buildings and high-end retailers as well. 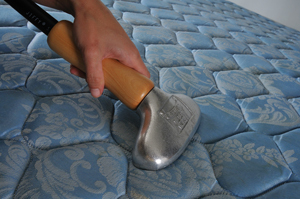 Often associated with unclean or unsanitary environments, bed bugs can live in any environment where people sleep or rest, as they feed on human blood. The Jiffy Steamer X-Series works by utilizing the power of steam. Clean water is contained within a one-gallon reservoir which uses a heating element to boil the water. Hot steam is generated and transferred through the 7.5" hose to disperse evenly from the unit's 6" wide steamer head. 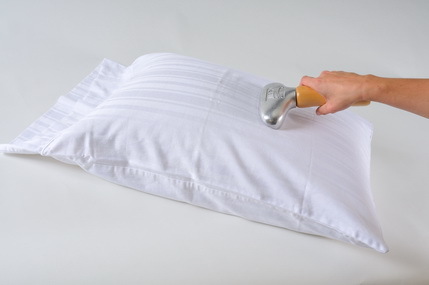 This hot steam penetrates deep into fibers, killing dust mites and bed bugs. That's it, no chemicals, no fumes, no costly add-ons or time-consuming treatments. Bed bugs and dust mites are killed on contact. This is an announcement concerning Termination of RC-9 & RCP-1 series Repair Work. As we announced previously, on March 31 2014, we will terminate the repair work of RC-9 & RCP-1 series as our holding period of repair parts is 8 years and we are unable to ensure replacement parts over this period. We would like to announce that YETC-210 have been upgraded into YETC-220 due to the production stoppage of the parts for YETC-210. Starting in September 2012, we have started offering the new Reflow Checker (Modular Type) RCX series and Flow Profiler FCX series for sale. As a result of this, we will terminate the sales of Reflow Checker RCP-600, Oxygen Monitor RCO-1 and Air Velocity Monitor RCW-1 in December 2012. For their repair and calibration, we will continue to support you. We look forward to providing these new products for you. Feel free to contact us with any inquiries. CHICOPEE, MA - Nortech Corporation has just introduced a new line of Static Conductive Vacuums, designed to eliminate nuisance static shocks commonly associated with vacuuming operations. Nortech engineers have created a powerful pneumatic vacuum that eliminates static electricity by incorporating static conductive components to suppress static charges. Models are available in 15, 30, and 55 gallon capacities. Because these vacuums are powered by compressed air, there are no moving parts to wear out, and all models feature the Nortech Forever Warranty. Nortech, a leading manufacturer of air powered vacuums, is a division of Guardair Corporation. NASHVILLE, January 26, 2012 - Tennessee Department of Labor & Workforce Development Commissioner Karla Davis announced that Jiffy Steamer Company, LLC in Union City was chosen to receive the SHARP (Safety and Health Achievement Recognition Program) award for the fifth consecutive year. "Jiffy Steamer shows a continued dedication to maintaining a safe and healthy workplace," said Kelly Parks, Occupational Health Consultant for TOSHA, who presented the SHARP award to the company today at the company's facility located at 4462 Ken-Tenn Highway in Union City. "We are pleased to honor this fine company for their notable safety record." The SHARP award, designed for employers in high-hazard industrial classifications, is one of the state's highest honors for workplace safety and health. The main incentive for participation in the SHARP award program is the desire by employers to promote a safe and healthy workplace. Jiffy Steamer, located in Union City, Tennessee, has been a worldwide leader in steaming equipment since 1940. They are the world's oldest and largest manufacturer of garment steamers for personal, travel, industrial and professional use. Jiffy Steamers are sold through its dealer network to 48 countries around the globe. "Jiffy Steamer is proud to accept this safety award from the State of Tennessee Department of Labor & Workforce Development," said Clint Joiner, Chief Operating Officer for Jiffy Steamer Company, LLC. "As a family-owned and operated company, we have a strong commitment to provide a safe working environment for our associates. We thank the department for recognizing our unwavering pledge to workplace safety." Thank you for your continued support of Malcom's Reflow Checkers. In the end of September, we will terminate the repair of Relfow Checker RC-9 series including Memory Units RCM-A, RCM-I, RCM-IH, RCM-V, RCM-F, RCM-FH, RCM-L and RCM-LH. And the repair of older models, such as RC-7 and RC-8 series, has already terminated. In the future, we are pleased that you purchase New Reflow Checker series, RCP-600 (USB connection) and RCR-60 (Wireless LAN connection). And please note that RCP-600 and RCR-60 are incompatible with the old models of Reflow Checkers. - PHN-1520 (W 32.5cm x L21.4cm x H4cm) We thank you for your understanding in this matter. September 16, 2008 Thank you for your habitual use of our MALCOM product. This is an important announcement for the user of our spiral viscometer on the viscosity measurement. It became clear that, when using the spiral viscometer for a long time, viscosity measurement value may be affected if the viscometer is used with worn inner and outer tubes (sensor portion). This is because prolonged viscosity measurement (*1) causes the inner tube and outer tube to wear and lose their original external dimensions due to abrasion, thus making it difficult to obtain correct measurement. This phenomenon is especially remarkable when using the solder paste (*2). When worn inner and outer tubes are used, correct viscosity value may not be indicated even if calibration is performed using the semi-standard calibration fluid (silicon calibration fluid) supplied by us. As a corrective measure against this problem, we established a service system where the wear on the customer's inner and outer tubes can be checked through comparison with the standard inner and outer tubes which we prepared newly for this purpose. For ensuring accurate and correct viscosity measurement, we ask you to undergo periodical wear inspection on the inner and outer tubes. Measurement can also be affected by the deformation and scar on the inner and outer tubes. This point should also be checked. For further details of this service, please make inquiry to our company. *1 The operating time when the measurement accuracy is begun to be affected is under investigation. This phenomenon is noted on devices used continuously for measurement for several years. *2 Thixotropic specimen containing materials that can abrade stainless-steel inner and outer tubes. * Production of PCU-5 is discontinued, and this service may not be applied depending on conditions. Recently, the shift to the lead free has changed the reflow soldering. The temperature of ovens are getting higher and soldering time longer. It caused batteries damaged and temperature errors to our memory units. Therefore, Reflow Checker, RC-9 series will be out of production from 1st April, 2004. We recommend that RC-100, RCP-100 series. However, for the customers using RC-9 adapter, we will be sale RC-9 series lead free models for ONE (1) YEAR. Because our new Reflow Checker, RC-100 series and RCP-100 series are not interchangeable with RC-9 series at all due to the differences of both connector types. For more detail information, please contact your local distributor, MVENT. If you have any questions, please do not hesitate to ask us.